Welcome to my website! 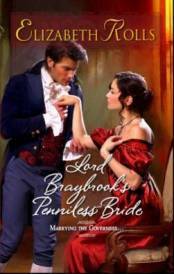 I’m Elizabeth Rolls and I write Regency historicals for Harlequin. I hope you’ll enjoy yourself here and send me a message. It’s great hearing from readers. You’ll find information on my previous books and upcoming releases, as well as news about what I’m doing at the moment, a short bio, and how I started writing. There is also a page with links to various websites, mainly other writers. Don’t forget to have a look at the photos page! We have quite a menagerie here and there is a new resident - one with feathers and a great deal of sheer unmitigated cheek. There are also photos taken at Monarto Zoo recently when I enjoyed a very special birthday present there. 2011 is nearly gone - and it's time for the Harlequin Historical Holiday Giveaway again. My day is 30th November. Click Here to link with the Advent Calendar. I've been having a little trouble with the html codes so this will take you to Michelle Willingham's site for the live Advent Calendar with all the links for the other authors. (Technophobe? Moi? Perish the thought!) MY question and answer are here on this site. On the 30th I'll post the information about what you need to find on this site and email me about to go into the daily draw for a signed copy of one of my books, and also into the Grand Draw on 23rd December for a Kindle Fire! Despite my winner for the 30th November being announced, you can still enter here to give yourself an extra chance to go in the draw for the Kindle Fire. Also, one person had trouble with my email links. So if the email buttons at the top of each page don't work for you, the addie is books at elizabethrolls.com. I can only wish the cursed spammers had so much trouble with my email buttons! Are you hoping Father Christmas will come through with a Kindle Fire this year? Check out the Harlequin Historical Holiday giveaway! And we have a WINNER for my Wedneday Draw! You can follow me on Facebook now. Come on over and join me!